This Red Chili Pasta Dough is a great spicy pasta served with vegetables or a light sauce. Can be made into noodles, ravioli or tortellini. Freeze the uncooked pasta for a quick meal on a busy day. In the large bowl of a food processor combine dry ingredients. Process on low speed just until combined, about 30 seconds. In small bowl combine tomato paste, olive oil, and eggs. Whisk together. With the food processor on low speed slowly add to dry ingredients and pulse just until dough holds together. About 30 seconds. Stop the processor and, using your hands, squeeze a small amount of dough into a ball. It should be moist enough to hold together but not sticky. If it is too dry, add a little water, 1 teaspoon at at time. Remove to counter or work surface, knead to get a smooth dough. If it’s sticky knead in a little more all-purpose flour. Put in plastic wrap and let rest for 30 minutes at room temperature or refrigerate and rest longer. Use your pasta maker to roll and shape your dough. If you don’t have a pasta roller you can do this by hand but it’s a lot more work. Unwrap your dough disk and divide into portions. I usually do about 6. Flatten the disk with your hands or a rolling pin into a rectangular shape flat enough to go through your largest setting, about 1/2″ and no wider than the pasta roller. Put your dough through on the largest setting, mine is 0 (zero). Fold it in half or thirds and place it through this setting again. Repeat this about 4 times. Then reduce the setting 1 number at time until the desired thickness. Cut your pasta to the desired shape using the pasta rollers or by hand. 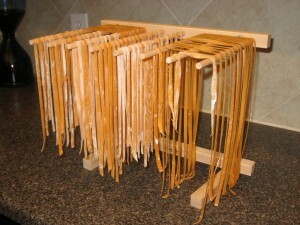 Place shaped pasta, separated, on a drying rack or floured surface until ready to cook. At this point you can cook or freeze your pasta. To Cook, heat a large pan of water to a boil. Add a couple tablespoons of salt, the pasta will get a lot of flavor from the salted water. Drop fresh pasta in and cook for 2 or 3 minutes until al dente; al dente describes pasta and (less commonly) rice or beans that have been cooked so as to be firm but not hard. When you bite into it there should still be a slight firmness. To Freeze, let the pasta dry slightly and dust well with flour. Place in a freezer container with a piece of parchment paper on the bottom. Put in freezer immediately so pasta does not begin to stick together. When ready to cook, remove from freezer directly into the boiling water.